Our Sea Fox boat covers are guaranteed to fit your fishing or pleasure boat. Got a t-top? No problem, we have a great fitting cover that even protects the t-top. Plus, we sell covers made to accommodate features such as dual outboards, rod holders, and VHF antennas. 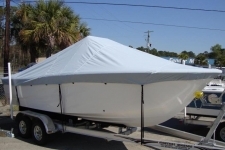 While you are shopping for your boat cover, consider our 7 oz. Sun-DURA™. This technologically advanced fabric is engineered to be fade resistant, so that your vibrant colors retain their new appearance. Highly UV resistant and water repellent, this revolutionary fabric is made in the USA by Carver Industries. The Sea Fox boats listed on this page are models which have a Carver cover that's been measured to fit your year and features. We suggest selecting your specific model when it's listed. If you don't see your model then search by size and style. Also, if you have a boat with a t-top that's not listed on this page then we sell Carver T-top boat covers based on the boat's style and dimensions. Since 2001, Boat Covers Direct® has been proud to offer Carver boat covers for SEA FOX boats. Made in the USA in Landrum, SC, these covers are manufactured using cutting edge technology in areas including material handling, cutting, and sewing. Over 30 years of experience have taught Carver important lessons in fabric choice and finishing for longevity. We believe that our customers are loyal to us because we take care of them. We stock popular SEA FOX covers and ship them out quickly, usually the same day that you place your order. Our customers like purchasing Made in the USA products, and selling these top quality covers and tops is important to us. Even though you only need to purchase a cover every 5, 7, or sometimes every 10 years, we want you to remember where you received the best cover and the most value for your money.